Today was my final day at the Edison EWSRA show in Parsippany, NJ. This was my first visit there and a very odd one at that. Picture an Embassy Suites with the second floor reserved for the reps to show their lines in the hotel rooms; sans living furniture and TV. Very odd showing environment. The bigger clothing companies however got the larger rooms that were more of a mini conference size allowing for better lighting and room to actually walk around to try on the pieces being shown. Outerwear has taken many paths over the past couple of years for the snowsports market. 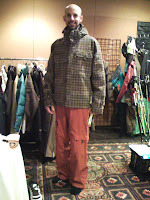 There are so many styles of jackets out there from ski companies that are super techy, traditional 2 tone, alpine looking. Or that style maybe injected with prints of some sort, roomier cuts across the chest and baggier pants. My favorite style lately are the well constructed ones with fabrics that have technical worthy abilities but are smothered in details as to allow you to wear it to dinner and not look like you rolled off the chair lift at one of our local rainy resorts. Details such as fabrics that look like nothing you'd consider wearing on the snow. Brushed nylon yielding a soft interaction against your torso inside the jacket along with corduroy, heiring bone, or even faux velvet as an outer layer on the jackets and pants. This attention to detail and style has been nailed down by Mikey Leblanc's brand, Holden. Other manu's are chasing that styling image as well. Scott Wintersport has some sick outerwear for the 2008/9 season. They've stepped it up from the current year's line going deeper into fabrics that have a nice hand to them as well a maxing out the detailing on the zippers, buttons, pockets and the overall cut of the materials which are sew together to complete the jacket and pant styling. Earth tones aren't going away as this clothing line is staying tried and true with it's contemporary, European styling. Enter my new kit for next year. The jacket is the Scott Overdrive and pants are the Unix. Here are the specifics for the mentioned items. Retailing for just under $300usd. Retailing a little over $200usd. Just an idea how all this fits on me. Some stats about my lanky body. Height is 6'4.5" Inseam a true 38.5in. Arm length of armpit to fist with a pencil in hand is roughly 27.5in. Torso length is crotch to sternum notch 23.5in. The jacket is a large and fits like many other larges out by the big brands like Salomon and The North Face. The pants are a large too and were sitting just a bit below my waist which is where I usually wear my riding pants. Good size on the jacket and the pant's length; I would personally buy the XL after mentally chewing on it for awhile. The cut of the jacket and pants are on what they call the relaxed side which is true in all arenas even with Levi jeans. The jacket's print has really small amounts of the Picante so I chose the pants to bring it out more. In person it's noticeable but when the pix was taken with my iPhone is was sort of lost in translation as they would say. Definitely check this stuff out for next winter. You won't be disappointed buy the quality, selection of men's and women's sku's and pricing is on par too. Now were is that snow?